Wow I just tried your tip and my write speed went up from 300MB/s to 1179MB/s! My mainboard should be able to use the whole bandwith tho because it already got a 32Gbit/s M.2 interface. 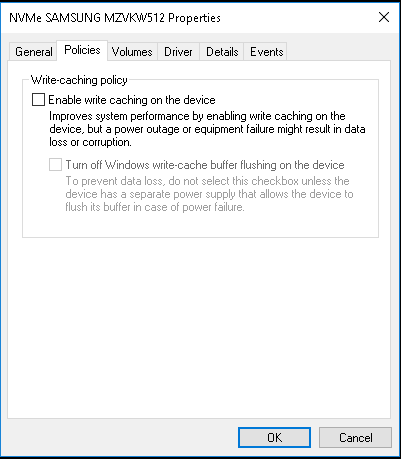 thanks for the tip it helped me to remove cache issue with my ssd. this was wat I was looking for. Crazy, this made me go for 99 MB to 1500! Wow. Thank you so much for this post. I was struggling with new HP ZBook which has Toshiba SSD drive with this new NVMe technology and I have noticed extremely bad writing speed. I have called IT department in the company I am working in and even HP and they have tried with some new drivers and such a things but noone was able to help me and solve this issues. I have tried this and results are amazing. Huge difference as you can see. Thanks again.